Ramesses Riches slot is a 5 reels and 20 paylines slot game themed on the amazing and very iconic ruler of Egypt, King Ramesses II. Powered by Microgaming, the theme takes you to Ancient Egypt where you can enjoy a series of bonuses that will boost your gameplay by far! 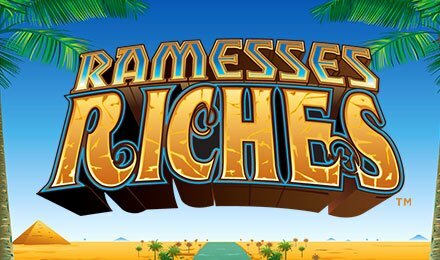 Enjoy the wonderful graphics of Ramesses Riches slot, that will have you enticed as you spin the reels! Enjoy playing Ramesses Riches at Moon Games, by setting your stake values and putting them to play! The Bet Max button allows you to make the maximum bet at one go, without having to do it manually! Amount of Paylines Selection: Pick from one to 10 paylines as they are adjustable. Coin Values: Stakes range from £0.50 to the maximum stake of £75.00. Ramesses is the Wild of Ramesses Riches slot, and replaces for any other symbol bar the scatter. When this symbol contributes to a winning combination, all outcomes are doubled. For 2, 3 4 or 5 symbols, 10, 100, 1,000 or 5,000 units are awarded. The Ankh is the scatter, and this symbol triggers the Free Spins Feature of Ramesses Riches slot. When three or more Ankh symbols appear on the reels, the Free Spins Feature is triggered. Four free spins are awarded. During this round, all payouts are subject to a 3x stake multiplier. The feature can be retriggered by landing additional scatters during the play of the feature. The Gamble button becomes active on a win spin. And the feature takes place on an alternate set of reels. On the right-hand side of the screen, you can quadruple your wins by guessing the suit of the card. To double your wins, you could simply guess the colour of the suit.